Early this morning in Montréal, signals from around the world were flooding in about Ali Mustafa’s violent death in Syria. A principled internationalist, thoughtful revolutionary and independent media maker, Ali’s beautiful spirit certainly lives on. Illustrated so beautifully by Palestinian artist Nidal El-Khairy above. On the ground in Aleppo, Ali died during an attack by Syrian military aircraft, killed by ruthless barrel bombs, dropped without distinction over the Hadariyeh area of the city. In Syria, Ali has stood side by side with the Syrian people, a movement photographerdocumenting the complex front-lines of a city struggling to survive massive and sustained violence. Clearly these simple words on Ali’s death fail to communicate the immense sorrow that Ali’s family and loved ones must have running through their hearts at this time. My love goes out to everyone remembering and celebrating Ali’s courageous life today. Ali’s death is yet another wake up call, a shocking reminder to the world, on the horrifying human tragedy currently unfolding in Syria, lands where people dare to dream and struggle for liberation despite a brutal government military campaign, rooted in internationally condemned practices of collective punishment, indiscriminate killings and sustained military blockades. Beyond tragedy Ali’s life speaks to the inspiring possibility for action in the face of immense injustice, the determined human spirit to seek and demand the impossible. Three years ago this month, as the word spread internationally about a growing grassroots protest movement against the Syrian dictatorship, including creative civil disobedience andpopular protests, activists internationally formed solidarity collectives, took to the streets and worked to develop more connections between progressive Syrian activists and global left networks. As repression against the Syrian opposition intensified, as the mass killings of people supporting the opposition mounted in 2013, Ali refused to stand idle and traveled to Syria. Beyond words, Ali’s trip to Syria asserted that physical presence, human bodies on the front lines, are at the heart of any and all liberation movements. Beyond clicking keys and watching news reports with feelings of tragedy, Ali moved and embarked on a grassroots, independent media voyage to Syria. Above the cynical words of politicians, or misinformed media pundits, spoken far away from the reality of conflict on the ground in Syria, Ali traveled to the front lines to be present as an independent media maker, to get out the grassroots story, to go beyond the mainstream media blur. 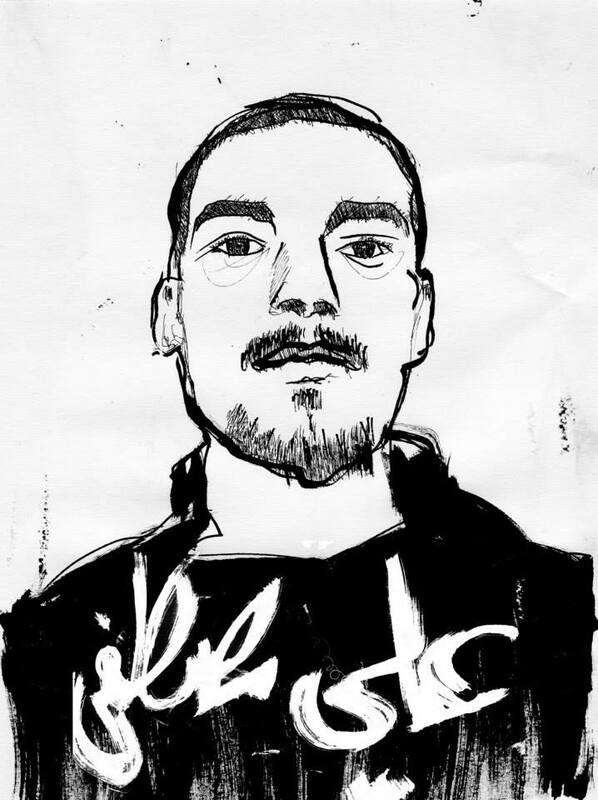 Ali traveled directly to the battle ground in Syria, communicating non official narratives, projecting peoples voices marginalized by mainstream reporting and discourses on Syria. Beyond conservative conceptions of professional journalism, Ali clearly viewed alternative media as an inspired practice, extending beyond stringent and unrealistic claims of objectivity, rooted in creating space for the voices of the most oppressed. I remember first meeting Ali in June 2010 at the alternative media centre in Toronto during the protests against the G20 summit. I clearly remember an open spirt, thoughtful words and kind eyes, illuminating a heart committed to justice and transformative social change. Over the next years I followed Ali’s work, writing and photography, it always was done from a perspective of solidarity, focused on telling marginalized stories, highlighting important voices and perspectives largely absent in the mainstream media, including reports on Security Certificate detainee Mohammad Mahjoub. Ali’s grounded alternative media work extended into multiple trips to Egypt and Syria, trips that told stories of ongoing revolutions. The following section from our 2013 interview in Upping the Anti illustrates this clearly. Can you describe the popular protests that you saw in Aleppo and day to day life in the city? It’s important to understand that most of the city is completely in ruins. 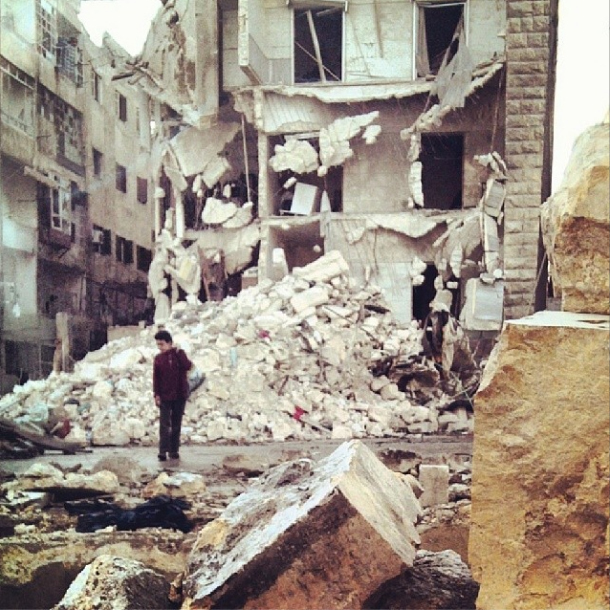 The scale of destruction is totally unimaginable, caused largely by government shelling. In the liberated areas, the government has cut off all services: there is no electricity, very little water, few jobs, and the economy is at a standstill. What is taking place there can only be accurately described as a form of collective punishment against a largely defenseless civilian population. We so often see images of the violence, death, and destruction in Syria today, but it is important to remember that despite this reality, in the areas away from the front-lines, people still try as best they can to live a normal life. People still walk the streets, vendors still sell goods, kids still go outside to play. People are just trying to find some semblance of normality amid all of the chaos. The resilience of the Syrian people really amazed me. I found the atmosphere of the protests to be very festive, cheerful, even celebratory. People were singing, dancing dabke, and waving the Syrian revolutionary flag. I remember going to my first protest in the neighbourhood of Bustan Qasr and asking myself, “Why are they bothering to protest in a place like this, where the government doesn’t even have any control?” I quickly realized they are not doing it for the sake of the Assad regime but rather, for themselves. The protests are a way of keeping up morale, showing a face of unity to the world that is constantly portraying them as divided, and most importantly, I think, trying to make the point that it isn’t only the guns doing the talking – the people still have a voice. Against all the odds, many people in Syria are still fighting for the original demands of the revolution: freedom, dignity, and social justice. At many of the protests people hold up signs, posters, and banners – many of them in English. The village of Kafr Nabl in the Idlib province is the most famous example of this kind of revolutionary creativity. But why do they do it? They are not just doing it for show. It is a direct appeal to the outside world for some kind of solidarity. Unfortunately, people in the West have failed to meet that call. The Syrian revolutionaries on the ground, the youth who first started the uprising, have been completely abandoned at a time when they need solidarity the most. Let us remember these words and honour Ali’s beautiful spirit by continuing to stand with people struggling for liberation on the front-lines, in Syria and all around the world.